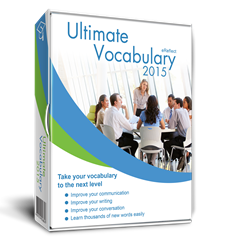 eReflect is proud to announce Mark Ways’ review of Ultimate Vocabulary™ 2015. Ways is the founder of Speed Reading Lounge, a website focused on literacy. He emphasizes the program’s efficiency in improve the user's vocabulary in little time and with minimum effort invested. Using a blend of new and traditional-but-reinvented activities means the program offers each use multiple ways to increase vocabulary, in a way that doesn’t feel intimidating. eReflect is a company that provides Ed Tech resources to individuals, businesses, and schools around the world. Following the release of their vocabulary-building program Ultimate Vocabulary™2015,the company has announced that Mark Ways of Speed Reading Lounge has provided a detailed positive evaluation of the program, highlighting its ability to broaden a user's vocabulary with minimum effort and in little time. Ultimate Vocabulary™ 2015 has been released in two editions, notes eReflect, one for individual users and one tailored for the classroom. The latter version offers an extensive set of customized and user-friendly tools for easy administration and student tracking, as well as the familiar fun games and activities the program is known for. For Ways, the main benefit of Ultimate Vocabulary™ is its usability and user-friendliness. He explains that the program offers the most extensive word database available, and how the user can access that database to get a wealth of linguistic information , from synonyms and antonyms to pronunciation and real life usage examples. One of the most important features of the program is the variety of learning approaches the user gets access to. Learning takes place through video tutorials, vocabulary games, and quizzes. Using a blend of new and traditional-but-reinvented activities means the program offers each use multiple ways to increase vocabulary, in a way that doesn’t feel intimidating. In his professional review, Ways also explains the importance of a new feature that enables group learning for home edition users of the program. The user can share his or her success with friends and family on Facebook, and invite other users to practice vocabulary together. Both the home edition and the vocabulary program for schools are cloud-based and enable Facebook sharing for users.